Why do some people feel crystals and others feel nothing? All manifest realities, seen and unseen, are the result of one source: pure consciousness. The following article was contributed by Mike Eggleston of Inner Vision Crystals. All things do this according to their own virtues and state of consciousness. Therefore, when we come into contact with them, they can assist in expanding our perception and awareness. Crystals are best used as tools through meditation, healing work, etc. However they are only effective if our consciousness is already tuned into a certain state of perception (and not complete chaos as most experience the waking state). The right state can be achieved through meditation, yoga, and other practices. The results of crystal and energy work will always be in direct accordance with the direction of our will and intention. The Universe is mental; it is thought projected from source, to material, i.e. spiritizing of matter. You already have everything you are searching for. It has just been forgotten, locked away within like a state of amnesia. Moreover, quantum physics and the new & ancient sciences show this just as the Mystics and Alchemists of the past explained. Many people and civilizations, from Egypt and the minds of alchemists like Galileo and Newton to Einstein, Tesla, Vogel, and many other scientists & philosophers, understood the direct relation between the spiritual and physical. They knew these two things needed to be understood together in order for our species to advance. Everything is energy, but the way in which our consciousness is confined within a physical materialization enforces limitations. The truth is that there are no limitations except those which we impose upon ourselves. At the very least, crystals and gems should be intriguing to anyone who lays eyes upon them. They should evoke thoughts about the beauty inherent within all things, in addition what it must have taken to create such things in the womb of Nature. Crystals themselves are not going to change your life, fix your problems or raise your consciousness. YOU do all of that. Crystals are merely tools, however when they used in certain ways, they amplify energy, intent & thoughts that we are putting out and natural energy within and around us. In turn, we manifest every experience as “good or bad”. Crystals and energy act as natural oscillators of sorts, because you apply energy and they do their thing. But it all comes from YOU, from within. I explain this when people say “I don’t feel it” or “it isn’t working”. We work with many tools until we learn what we have to learn throughout life and gain the experience to transmute knowledge into wisdom. Meditation will help, because that is the greatest tool we have at our disposal. It is Alchemy at its finest. If we wish to understand the great secrets of Nature then we must seek that within ourselves. KNOW THYSELF – and thou shall know all the secrets of the universe and of the Gods. 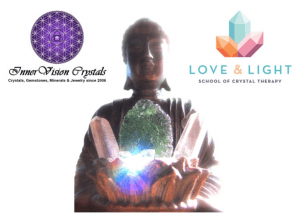 A very special thanks from all of us here at the Love & Light School to Mike Eggleston of Inner Vision Crystals for allowing us to share this article. Click Here to get to know more about Mike and IVC. If you’re looking for some amazing quality gemstones at fantastic prices, please be sure to check out the Inner Vision Crystals website. Want to know more? Sign up below to get your hands on a copy of our FREE Mini Crystal Healing eBook! Why do some feel crystals and others Feel nothing? Crystals are just our tools, the real answer to making crystals and energy work for you is your consciousness. Hi Virginia– that is so wonderful! It’s never too late to start sensing energy <3 Crystal blessings! So….is he saying that if we don’t feel crystals, our consciousness isn’t very high? That’s kind of what I got from the article, although I could have misinterpreted his meaning. I meditate at least 20 minutes a day and hold my crystals while doing so, yet I rarely feel anything from them. I tend not to be very sensitive to energy, for whatever reason. It’s frustrating to me and I didn’t really find the article particularly helpful. It took me about a year to start feeling their energies, so can relate to this article. Was getting frustrated but I would say just stick with it and it will come. Moldavite helped kick start my spirituality, can not say enough good things about that stone. Also if you watch Robert Simmons videos, he also struggled with the same issue. He would meditate with his hands on piles of Moldavite and not feel anything. And he is literally writing books on them now, so have hope! I sense and feel Crystals with my hands, especially the non dominant (left hand). It works from a lot of years (I started studying Crystal Theraphy in 2004), and it works better since when I took the first level Reiki some years ago. I use this gift of mine to choose Crystals when I buy them, and this is why I don’t buy Crystals on web but only in person. I have to see, feel and touch them. I think it works like this because I am an Adult Crystal (exactly a Rainbow Adult Crystal). When I meditate with Crystals, I see a lot of images too. I think sensitivity to stone energy is a ‘natural talent’, like singing or being good with numbers. Like singing or math too, if you don’t have the natural talent, you can gain skill and sensitivity through an open mind and practice. And, like anything else, once you put the parameter of “I can’t do this!” on yourself, it’s there until you take it off. I purchased my moldavite from Inner Visions – one and only stone I’ve bought online and it is perfect for me. Very interesting perspective, Lisa! Thanks for sharing 🙂 We are so happy that you’re enjoying your moldavite from Inner Visions– they are truly amazing!! <3 Crystal blessings!